Thanks for participating in our A Muse Studio team’s blog hop. I hope you had fun exploring Sandi and Sunghee‘s blogs. They are some very talented ladies. I am so proud to be a part of their team. I am featuring a card from the A Muse Studio designers. They used products that are featured in February Spotlight Promotion. Not only is there a new promotion for this month. But today is also the release date for the new 2012 A Muse Studio Catalog!! Excitement!! You check it out on-line on my website until you get your own hard copy. There are some awesome new sets and accessories. Thanks for taking time to explore my blog and have fun at Chris‘. She always has beautiful projects. This entry was posted in A*muse Studio Promotions, Cards, Rubber Stamped Items and tagged A Muse Studio Spotlight, blog hop, greeting card, Leaves, rubber stamping. Bookmark the permalink. You are so talented, too! So thankful to be your a muse friends! I love this card! Just beautiful! Simple but yet very elegant! What a pretty card, love that the sentiment piece has that woodgrain. Really nice touch. What a simple and elegant card! Love it. Graet card- love the woodgrain too! Awesome Kandy! I am so glad you participated in the hop. You picked a great card to feature. Go get em with the awesome new catalog! I can not wait to hear what you think about it! So nice! I love that you stamped the sentiment over the woodgrain DP…Looks great! so awesome, love the color combos on this card!!!! What a classy card! Love this sentiment! Such a beautiful clean & simple card. 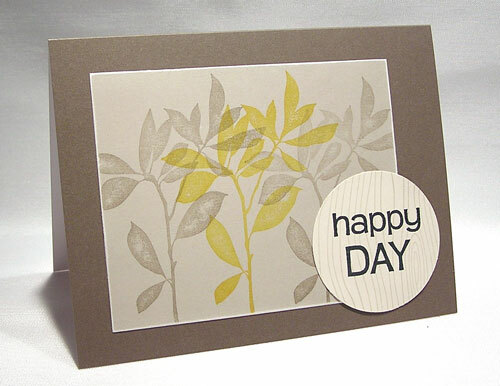 I love the soft colours and love the woodgrain background on the circle sentiment!